Many women in the restaurant industry have looked around their workplaces to see that they're the only woman in a management role, in the kitchen or behind the bar. Kelly Songy's employees don't have that issue. "I do try to hire women for management positions," she said. "Actually, it's kind of naturally evolved that we're a staff of only women." Songy and her husband invested in their first franchise - a Wow Café and Wingery - when they were 22 and 25, respectively. They borrowed money from her father-in-law and the bank to make the investment, and they both moved in with her parents while they worked long hours to get their venture off the ground. "We were okay with the risk-reward factor," she said. "That was our favorite time - in the beginning - where you kind of don't know which end is up. But, it feels good for some reason." As a manager, Songy likes to focus on two things: positivity and individuality. She treats all employees like they are capable of excellent work and views every problem as an opportunity to improve. She also recognizes that each employee has distinct strengths and areas for growth. She sets individual goals for staff members and adjusts her feedback to match different communication styles. Along the way, Songy makes sure her employees know that their hard work doesn't go unnoticed. "I make sure I thank people daily," she said. "I don't let moments of greatness go unappreciated. We do 'PJ's family night out' to reward the whole staff together - whether that's playing laser tag or doing family game night inside the store in the evening. A competent manager has no need to micromanage, Songy said, because she's already given her employees the tools they need to excel. "I've worked under great managers, and I've worked under terrible ones, and the terrible ones are breathing down your back, correcting what you're doing as you do it or before you've done it," she said. "You've got to be able to step away and trust that you've done a good job teaching people. I kind of let them sink or swim. We'll clean up the mess if it happens." A work environment that hinges on teamwork makes this "sink or swim" approach possible. Songy said her staff makes a habit of supporting each other and talking honestly about issues. With a helpful team at the ready, each employee is free to take risks and develop her strengths. When Songy started out in the coffee business, she felt like she was in over her head. But she proved to herself that she could conquer any challenge the business flung her way. "To learn it all and to see that I can do this on my own, it's given me so much self-confidence," she said. "This is home to me, when I'm at work. My kids were raised in the back of this store. Business ownership is so much a part of me, I can't separate it at all." Songy tries to foster the same self-confidence in her employees. She's loved watching her long-time store manager grow into a confident boss with her own management style. And she hopes that the smart, hardworking women in her store inspire other female franchisees to pursue their entrepreneurial goals. "Women are more than capable. There is an attention to detail, a kindness, an understanding, and patience," she said. "I was so scared in the beginning. I did not know if I could do it. But the skills to run a business are kind of inherent. You'd be surprised what's all in there and ready to go." 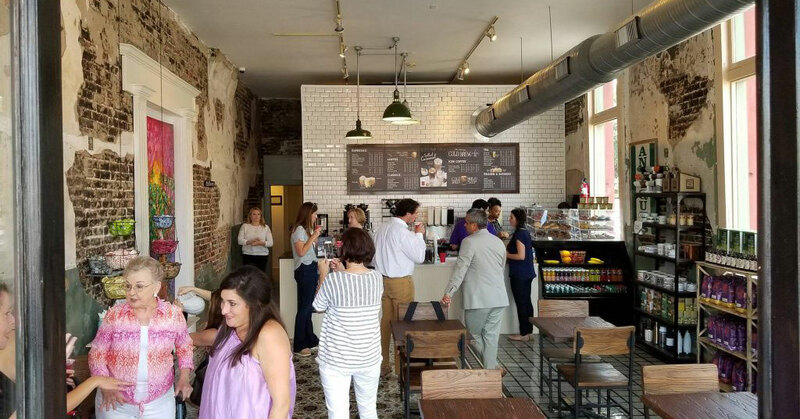 To learn how PJ's Coffee supports its franchisees through each step of the process, download the PJ's Coffee franchise brochure today.